GEN1REV22: IMPRESSIVE FEATS OF ENGINEERING : Flying robot insects . 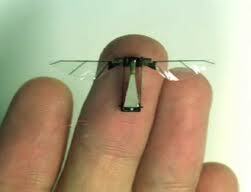 IMPRESSIVE FEATS OF ENGINEERING : Flying robot insects . If these flying insect robots are being described as "impressive feats of engineering" then what words would describe the real "impressive feats of engineering" from which the information is gleaned in order for humans to create such poor copies ? Dr Jon Dyhr, a biologist from the University of Washington who also studies insect flight, said these flying robots were "impressive feats of engineering". "The physics of flight at such small scales is relatively poorly understood which makes designing small flying systems very difficult," he told BBC News, adding that biological systems provided "critical insights into designing our own artificial flyers". "REVEALED in the FLESH 2000 years ago"